A man in a shiny vest smiles broadly at the audience. He speaks a little too loud. He over-enunciates his words. He has the air of someone not to be trusted. He has, shall we say, the air of a showman – the kind you may find working the stages of cruise liners and small Las Vegas clubs and old music hall pavilions in Britain. He ingratiates himself. He begs for your indulgence. The audience wonders whether this will be a long night at the theater. We grow impatient with this cheery man. We look at our watches. After some moments, a story of sorts begins. We learn that this effusively ebullient fellow is a hypnotist. Or rather, an actor playing the part of a hypnotist. We learn a tragedy has transpired over a year ago. Though sometimes it seems to have happened yesterday. We learn soon that time in this play moves unusually. We come to understand that the tragedy is personal. A girl has died. A young girl. She has been killed in a car accident. It is awful. But it is, as some say, an ordinary tragedy. It was an accident, after all. The hypnotist was driving. He didn’t see her quite. He knows he is guilty. Perhaps that is why he is trying so hard to be cheery and put on a show. Perhaps this is his way of coping with what happened. A person is asked to join the actor who plays the hypnotist. This person may be an actor or not. She (or he) does not know the script. She does not know what to say ahead of time. She seems nervous. The hypnotist-actor gives the person instructions quietly. She is asked to say lines (fed via headphones, or sometimes whispered by the actor-hypnotist). Soon we realize that this person is being asked to say the words of the parent who lost his daughter in the accident. Things become less cheery. More difficult. Both the hypnotist-actor and the other person -- now acting, or at very least doing what actors do, saying scripted lines in front of an audience and conveying something about being human -- are in a play. Of sorts. Except this play does not “behave” like a play. In fact, this play seems to resist at nearly every turn what plays do – allow for suspension of disbelief, sustain an illusion of representation and presentation at the same time, and ask its audience to identify with those onstage. Not that this play entirely avoids all of that. It rather resists what is usually regarded as “proper” dramaturgical behavior. As soon as you begin to identify with the person presenting the voice of the parent, the play stops to interrogate itself, or the audience, or time, or its very apparatus. As soon as you may wish for an action or a moment to move quickly, a silence envelops the stage, which can last a very long time, enough for awkwardness to set in, or even irritability. But despite its resistances, despite the play’s insistence on its artifice and its somewhat exposed mechanics, something rather curious occurs. You actually begin to identify with the bereaved parent. You start to imagine the young girl who once played the piano and will no longer. You start to, well, become emotional. You may even begin to cry. In this rather unadorned space. At this rather unabashedly “artificial” event called a play. It is a tad embarrassing. Because it seems inexplicable that you have somehow fallen for and into a story. Yet again. That you have somehow believed this person being given scripted lines is the parent even though he or she may not even resemble him. The person may in fact be quite opposite in gender, physicality and age. It seems almost impossible that you even care about such an ingratiating hypnotist figure. But against all odds, you do. Your struggle over whether it is possible to feel something in the theater, something, shall we say, true, is resolved by this play called An Oak Tree. And you are not even sure why. When the play is over, after about seventy minutes, you are a little dazed. You are perhaps on an odd “high.” You feel awake and alive. You remember that this is what theater does – it reminds you of being human. And it makes you re-see the world. You start to ask yourself, “how did this happen?” Again, you are not sure why. Tim Crouch called the play An Oak Tree in homage to a famous 1973 art installation by Michael Craig-Martin, which displays a glass of water resting on a glass shelf 253 centimeters above the ground. Below it, at slight distance, is a text in which Craig-Martin says that he has changed the glass of water into an oak tree. The work, which is considered a landmark in the history of conceptual art, has been both acclaimed and derided in nearly equal measure since it was first displayed, and it still stirs debate in some circles. Craig-Martin asks the viewer to see the oak tree in the glass of water – to acknowledge the presence of the tree in its “absence.” It is an act of transubstantiation, to use a religious analogy. It is also a remarkably appropriate inspiration for reflection on theater, which also asks audiences to imagine and thus “see” and make “real” fictive characters and objects standing in for other things. 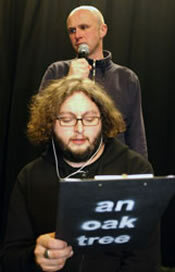 Crouch’s complicated relationship, as actor, writer and co-director, with representation, mimesis and the “real” is at the center of An Oak Tree as well as his subsequent works for performance. Although Crouch had been working as an actor for over fifteen years and had also written and performed works for youth and children, my initial encounter with him was his first solo play for an adult audience, My Arm, when it was presented in 2004 at 59E59 Theatre in New York City. The play shares themes as well as stylistic concerns with An Oak Tree. It is, in brief, about a perhaps capricious or impulsively defiant act of protest -- one day a young man raises his left arm above his head and refuses to put it down -- that turns into a liberating act of art-making. It also ultimately becomes an act of self-annihilation. My Arm is a deceptively simple piece that examines how someone determines his position in the world and how he is seen, perceived and judged by others, including family, friends, and strangers. Since that time, Crouch and I have had the opportunity to talk about life, art and theater in private and in print on various occasions, when he has been in the U.S. or when we have connected abroad. I have also gotten to know his close collaborator Andy Smith. I write this, therefore, as a friend who initially came to the work strictly as an adventurous audience member – not knowing anything more than reviews I had read about My Arm’s successful premiere in Edinburgh. 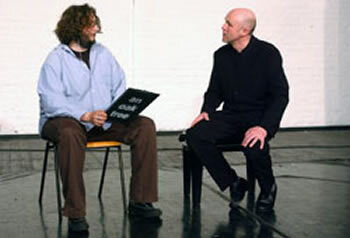 An Oak Tree, co-directed with Karl James and Andy Smith, created on the heels of My Arm’s enthusiastic critical reception worldwide, solidified Crouch’s reputation as one of the U.K.’s most significant theater-makers. Developed, in part, through a residency at the National Theatre Studio, the play’s eerily concise dramaturgy of unease challenges audiences to come to terms with how stories of grief are often packaged and told. At the play’s opening, the charlatan hypnotist figure seems to promise through his words and actions no more than entertainment, but the entertainment is dislodged, disrupted by the state of grief evoked, which refuses containment by the story. It haunts the theatrical proceedings. The hypnotist figure’s gestures begin to ring hollow. The stage seems impossibly naked. There is no hiding place in the space, even when the hypnotist figure walks off for a while. Grief is subjected to dissection through words and images and other theatrical means, and the manner in which the piece disturbs turns out to be exhilarating. I saw the play for the first time under rather odd circumstances: on a screen. Crouch had shared an archival recording with me of a performance in Glasgow where the actor who stepped into the script was the director, writer and performer Jon Spooner. The recording was not ideal. The sound quality was poor and the camera angle problematic. Nevertheless, something cut through the screen. Something disturbing, unusually precise in its emotional affect, and true to itself. The second time I saw An Oak Tree was in New York City at the Barrow Street Theatre. The second performer this time was not someone I recognized from within the theater and performance community or the broader arts field. It was a matinee. The second performer seemed utterly uncomfortable during the whole performance, despite Crouch’s clearly careful handling of her discomfort. It was, as those of us in the theater say, an “off” show. The chemistry was simply not there. And yet, despite that, the piece still somehow came through. That is to say, the text, its affect and its determined lack of affect, held. The third time I saw it was in 2007 at a theater conference in Leeds, England, where Crouch performed it with Terry O’Connor of the legendary Sheffield collective Forced Entertainment. The piece was presented in the late afternoon after a very long day of panels, lectures and artist talks. The audience of scholars and practitioners from around the world had been packed into a hall for hours. We all wanted a break, but we were also along for the ride, happily if wearily. O’Connor is such a unique presence. So vulnerable, so direct. She brought something rare to the piece (as every performer of the second part does). I heard things I swore I had not heard before. In the middle of this Leeds performance, a scholar in the audience stood up, walked down the aisle and exited. Rather loudly. Crouch and O’Connor stopped. They watched him leave. They acknowledged his exit in silence and carried on. Now, many uncomfortable things occur at academic theater conferences, even ones like this where scholars and practitioners mix in fairly equal proportions, but I don’t recall any other case of such a resounding exit during a performance. I was concerned, as were friends in the audience. Much later, Crouch and Smith said that they had been concerned too. They had been touring the piece for almost a year and had been exposed to all sorts of reactions, but never one like this. It turned out the fleeing scholar found the subject matter too close to home. He had lost a child recently and could not sit witnessing a story of grieving so similar to his own. Ten years after it first premiered, An Oak Tree was revived in a special engagement at the National Theatre in London (23 June to 15 July 2015)—a well-deserved honor that led me to reflect on my multiple experiences of it. Often a slick patina of prestige embalms a work of art when a touted revival is mounted. In this case, the revival rather affirmed the piece’s daring and extraordinary vitality. In An Oak Tree, the acts of seeing and not seeing are magnified by both the story and the storytelling method. We see an actor give “notes” to another performer, scripted lines in what seems to be and is partly an improvised format. The second actor is new every night and must come into the experience with no prior knowledge of the script. We witness in our mind’s eye a car accident take the life of a girl. We imagine what it is like to see a tree become the same girl in a parent’s description of her loss. We hear the girl’s piano recital through a recorded sound cue and are moved despite knowing it is not the “real” girl playing. This is not docu-theater, after all. It is a work of fiction. Indeed, that is emphasized over the whole seventy minutes, yet we still end up feeling somehow anchored to “truth.” An Oak Tree is built on the essential quality of presence that makes all performances resonate while simultaneously operating in a zone of absence; here the absence is tied to grief and heightened by the fact that the role of the absented parent is embodied every night by someone absent from the work’s rehearsed creation. An Oak Tree continues to defy expectations. Even to someone who walks in knowing how it is structured, it still seems an improbable event. In fact, it feels every time as if it might fall apart at any moment. Yet miraculously, it doesn’t, as its lucid heart keeps beating through its distancing strategies with inimitable rigor and grace.